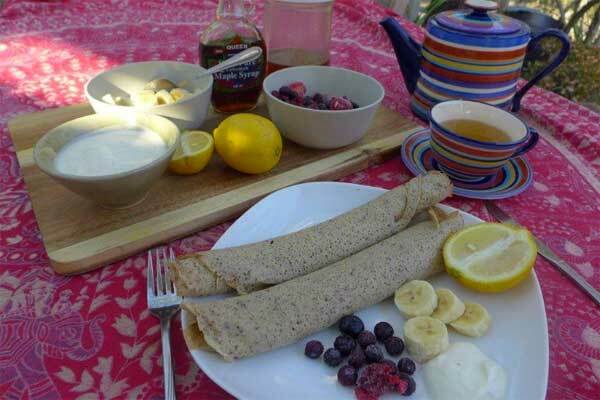 Tory has made these pancakes for years with just the buckwheat flour, they are delicious and so easy. The rule of thumb with pancakes is often the first one is not so good, so don’t worry, the rest will be great. The flax seeds add fibre and omega 3’s for a super healthy start to the day. Whisk eggs in a large bowl, add half of the milk, whisk again till combined then add the flour. Keep whisking until no lumps adding the rest of the milk then gradually all of the water until a runny consistency. Add the flaxseeds and stir. Start to heat a non stick pan then grease when the heat picks up, use some paper towel to wipe on the oil or butter. When the oil or butter is bubbling, ladle a spoon of mixture onto the pan and swirl around to get an even circle in the pan. When the corners start to curl up flip the pancake over and cook the other side…about a minute each side. You may need to add more water to the mixture as you go. Serve with lemon, coconut kefir or fresh cream and maple syrup. Of course strawberries and yogurt and honey are delicious too!